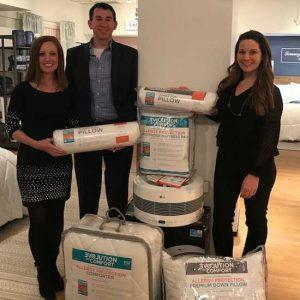 The NY Home Fashions Market Week, from the 19th to the 22nd of March, brought several of our certified clients to showcase their innovative asthma & allergy products for the house. The Home Fashions Market Week is the leading marketplace for stakeholders to converge and bring out latest product and services in home decor, furniture and home accessories. The event was the perfect occasion for Allergy Standards (ASL) to announce the great expansion of the certification. The showrooms during NY Home Fashions Market Week traditionally focus on home textiles directed at volume retailers but was shaken up this year with several textile manufacturers choosing to include product displays of other products that contribute to a healthier home, as consumers are becoming more concerned with health, sustainability, and the reduction of harmful chemicals in the products they buy. For instance, the bedding company, Downlite, were showcasing their innovative asthma & allergy friendly® certified bedding products at the show along with the latest certified LG Puricare air purifier. It was also the occasion for Allergy Standards to make a big announcement regarding the expansion of certified asthma & allergy friendly® home textile products into various retail stores in America as well as availability for the first time in international retail outlets. “Asthma and allergies are a health concern worldwide, not just in the U.S., so it is important to Allergy Standards that we are able meet the needs of consumers in all countries with the peace of mind that they can now purchase healthier and safer home textile products. We are delighted to announce that the asthma & allergy friendly® Certification Mark can be found on a variety of bedding products in Europe, the Middle East, and Asia, as well as America and Canada,”said Dr. John McKeon, CEO of Allergy Standards Ltd.
ASL also discussed the addition of an asthma and allergy component authorization program to be available for sourcing suppliers later this year which will provide supply chain auditing and compliance in the home textile industry.